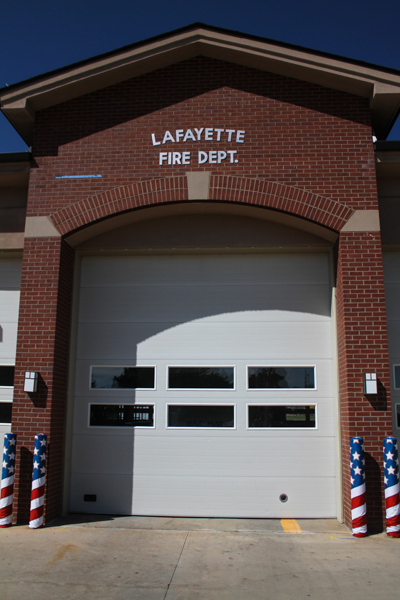 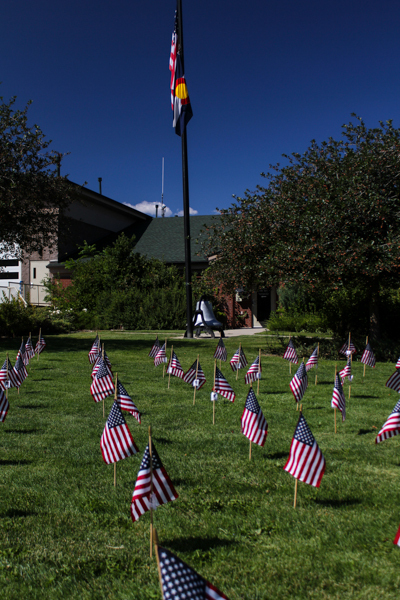 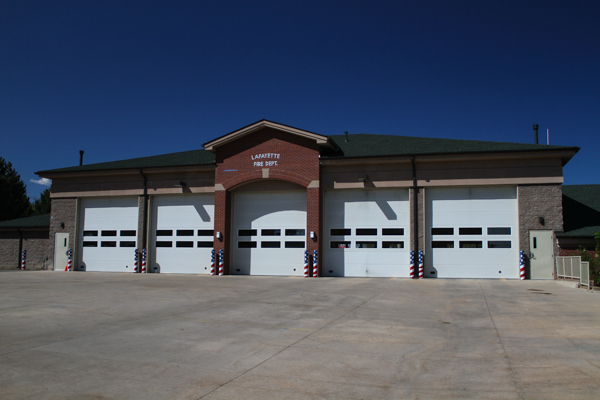 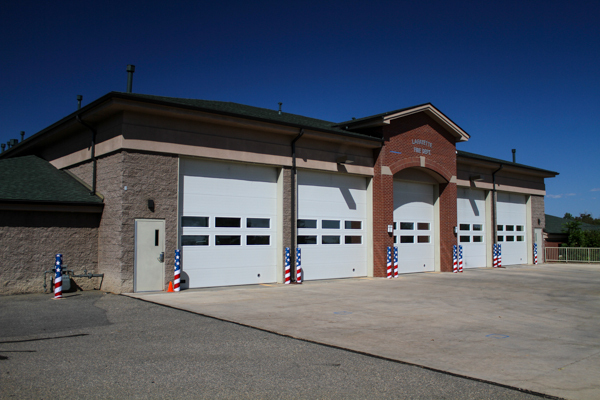 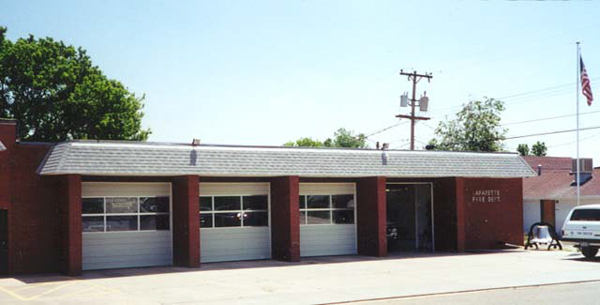 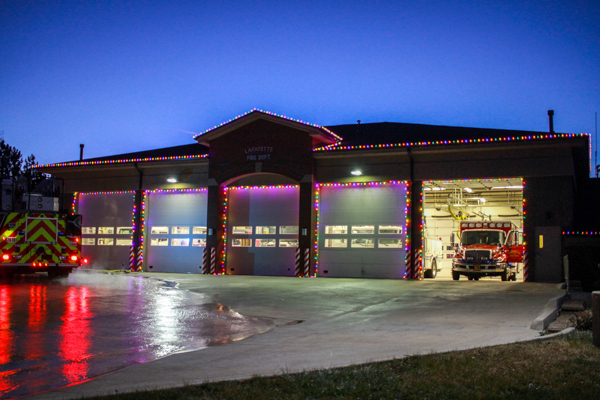 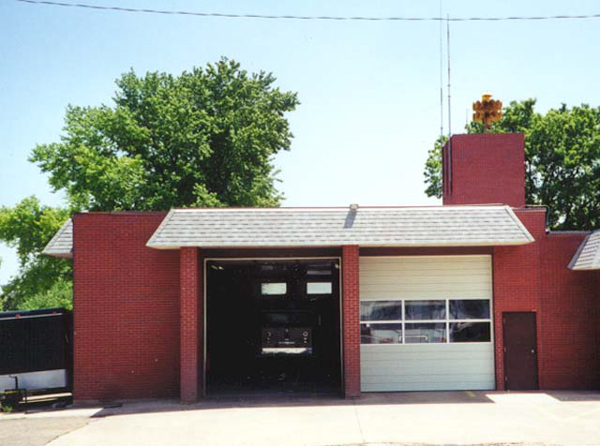 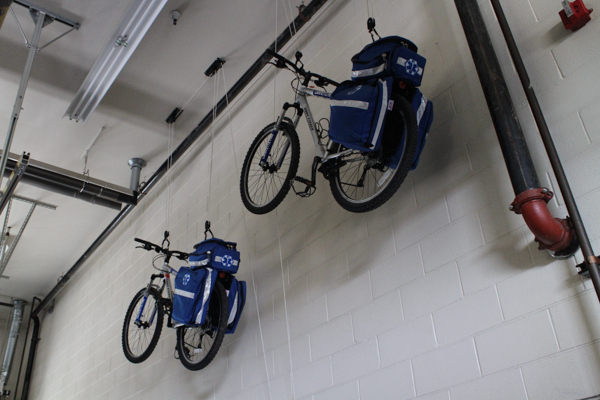 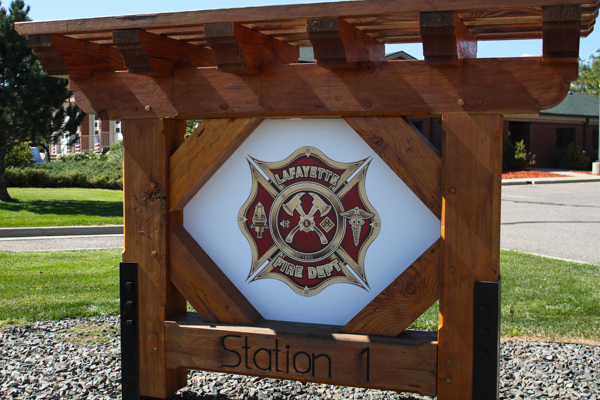 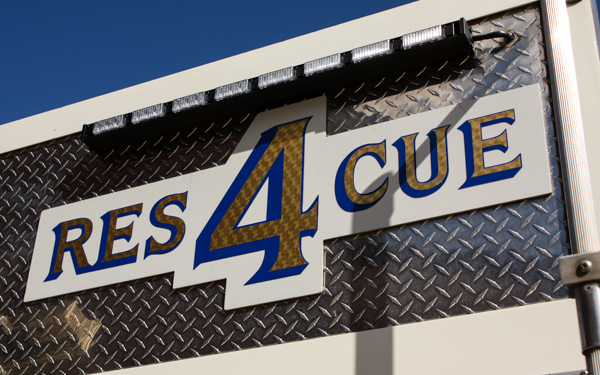 Fire Station 1 is located at 401 N. 111th St. and dedicated in 1999. 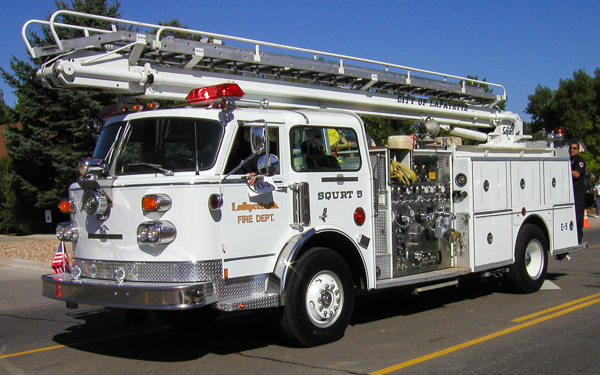 1998 Pierce Lance 65′ Tele-Squrt Snorkel 500 gallon water tank with 25 gallons of foam, also ran as Engine 2. 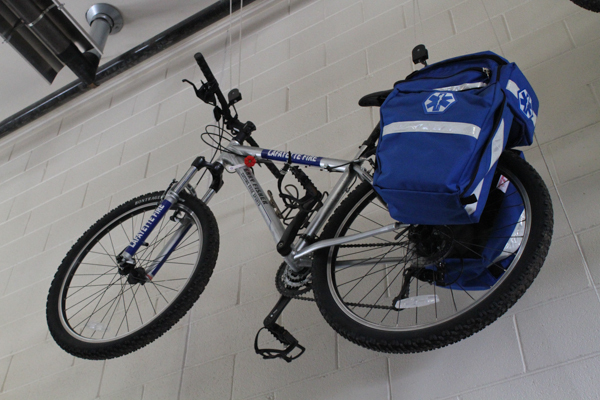 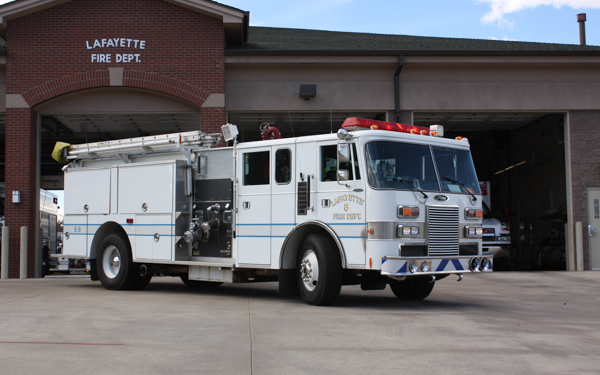 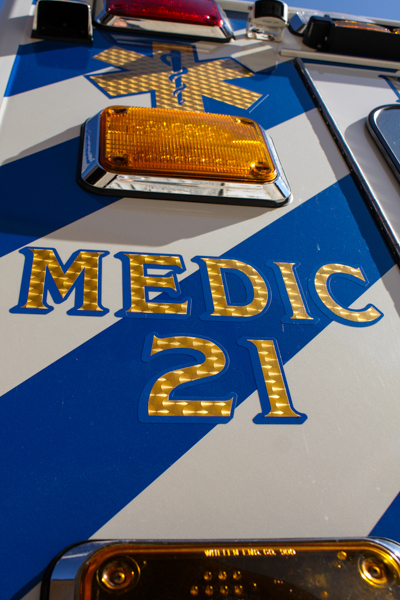 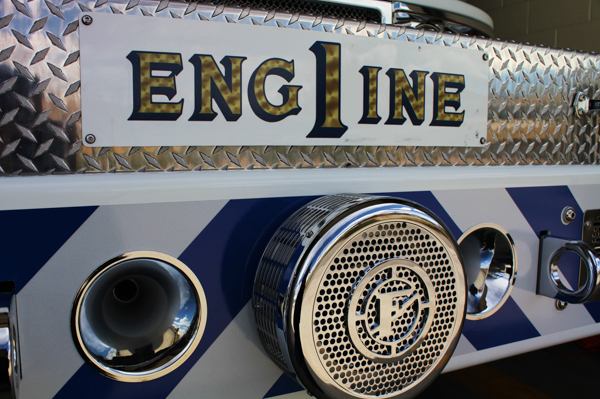 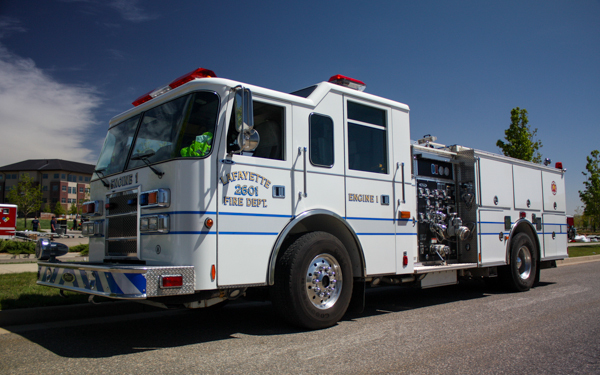 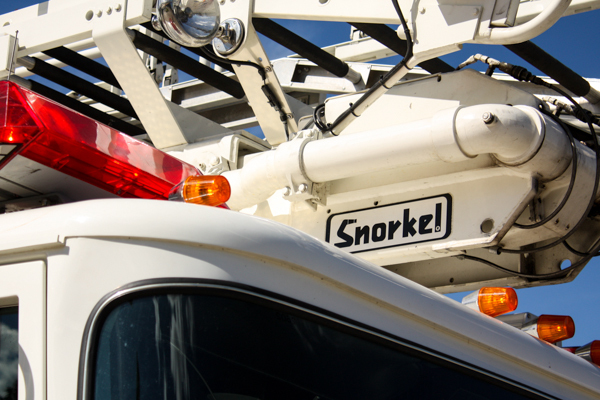 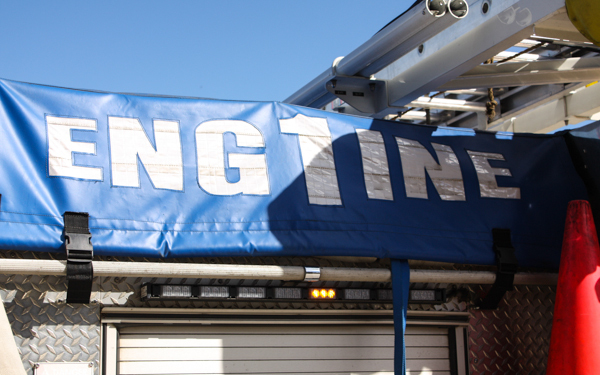 2014 E-One (Paramedic Truck Company) 100′ rear-mount aerial, first due out on all calls. 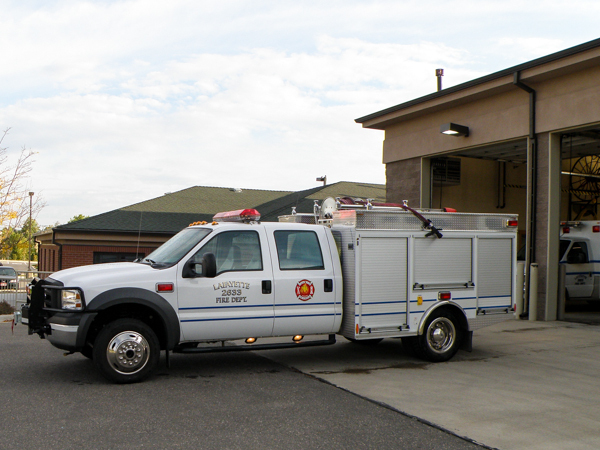 2011 Pierce Quantum 550 gallon water tank / 1500 gpm pump with 30 gallons of foam. 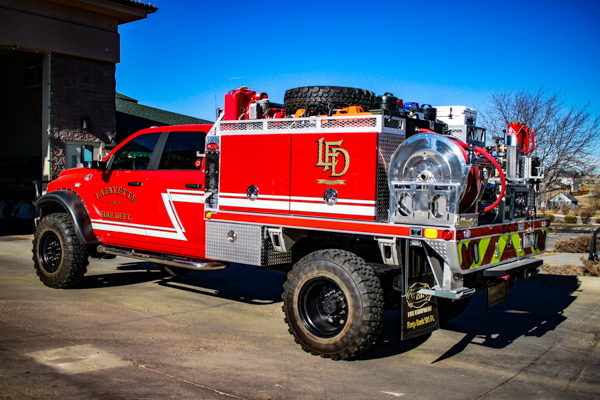 2017 Dodge Ram 5500 Crew Cab 4×4 / Weis 400 gallon water tank with 10 gallons of foam and quick mount winch. 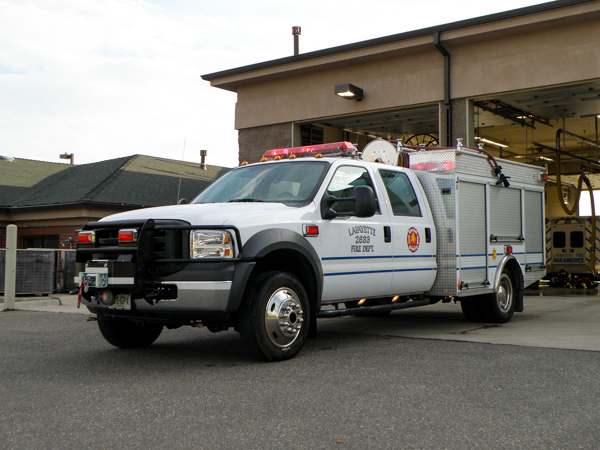 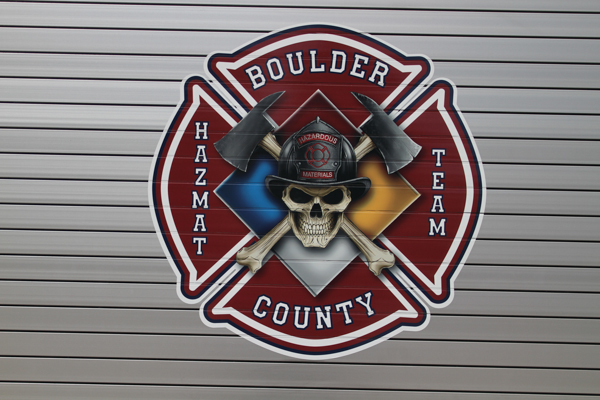 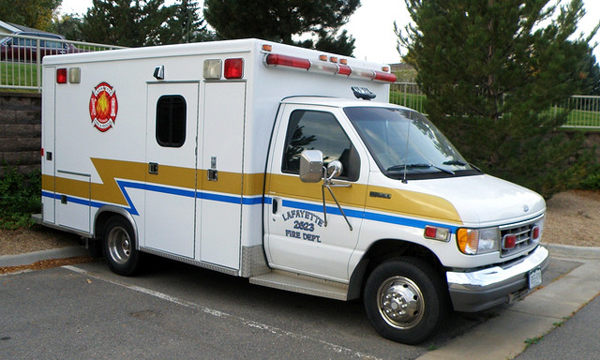 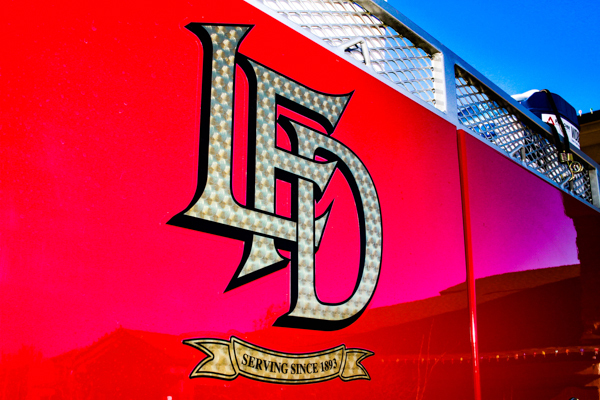 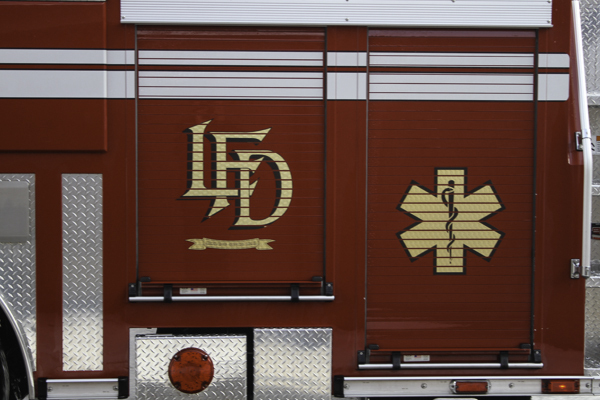 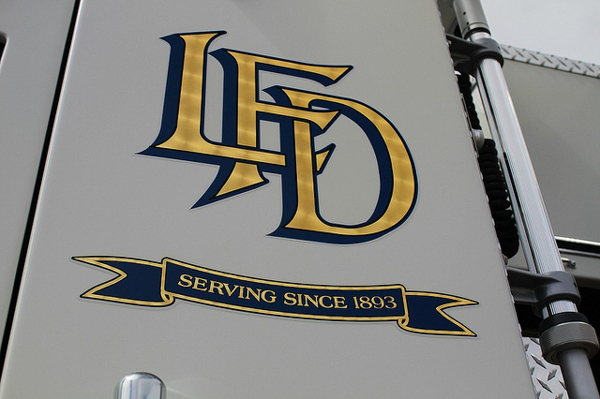 2001 Freightliner FL-80 / American LaFrance, also ran as Rescue 2624, and is part of the Boulder County Haz-Mat Team. 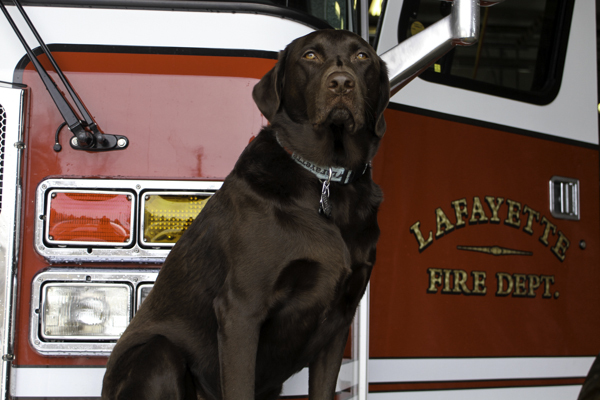 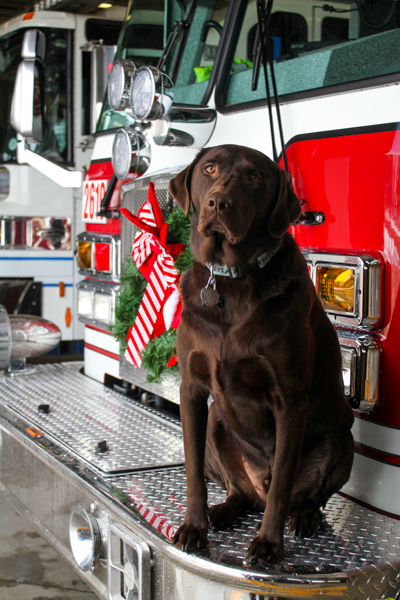 Station 1 mascot “Charlie” the “Firehouse Dog”. 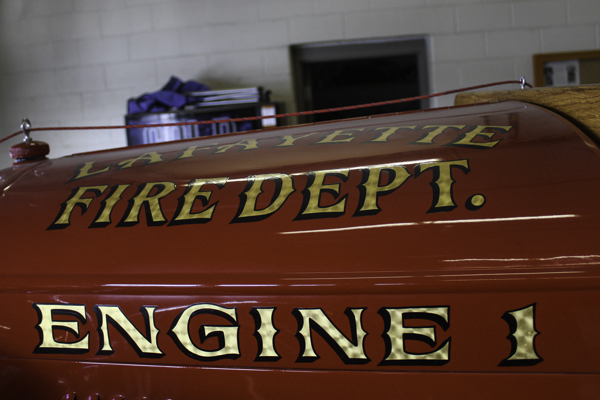 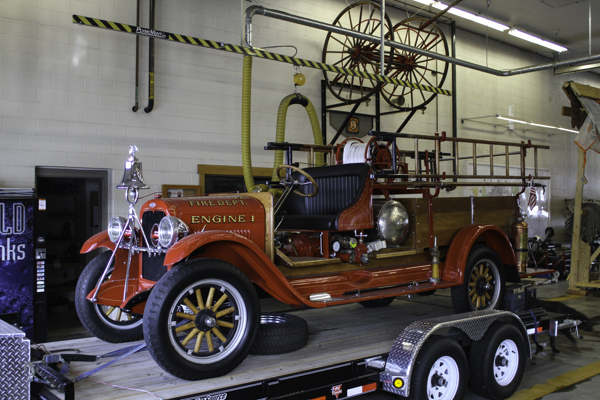 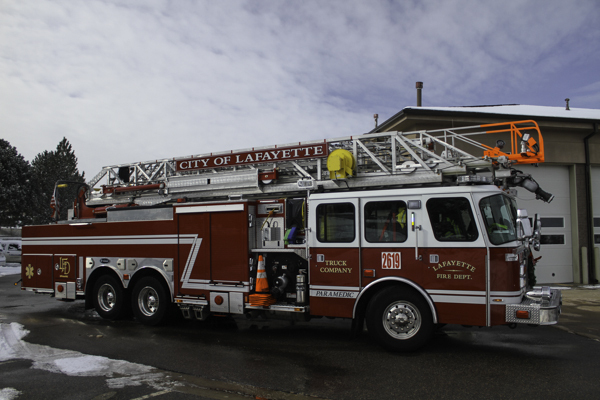 1973 American LaFrance Pioneer (P-16-3230) 500 gallon water tank / 750 gpm pump. 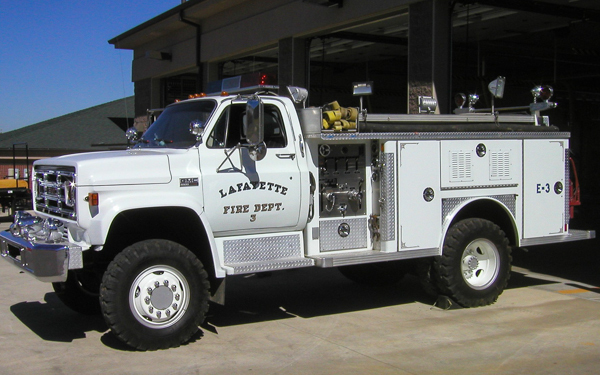 1967 Ford C850 / American LaFrance 500 gallon water tank / 750 gpm pump. 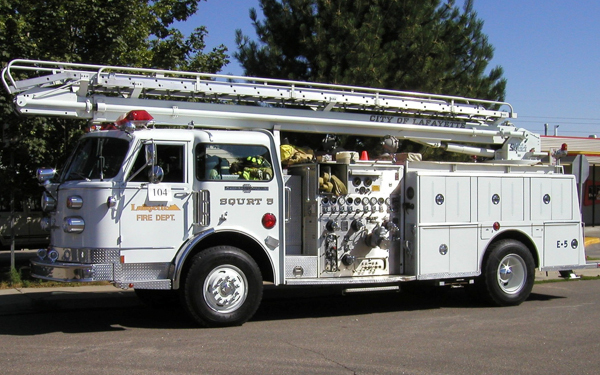 1978 GMC 6500 4×4 / E-One (656) 500 gallon water tank / 250 gpm pump, also ran as Engine 2633, and also Boulder Emergency Squad Rescue 3132. 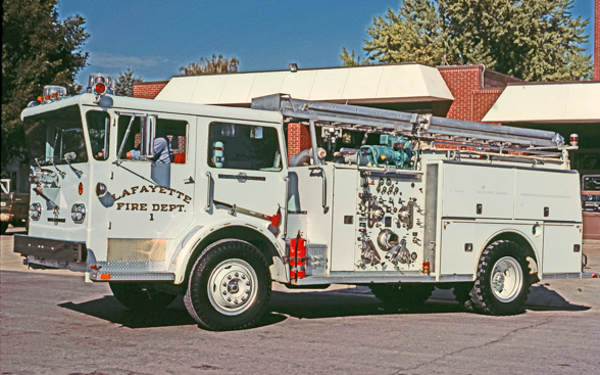 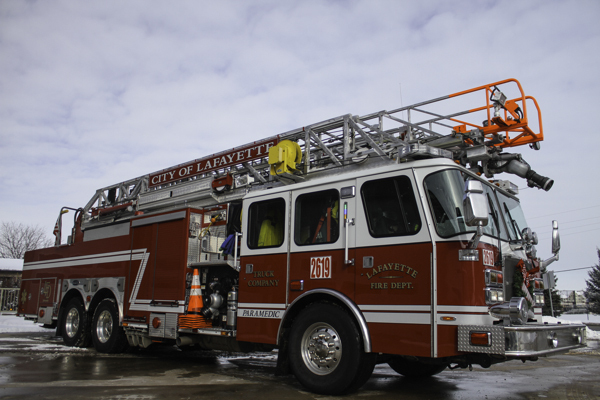 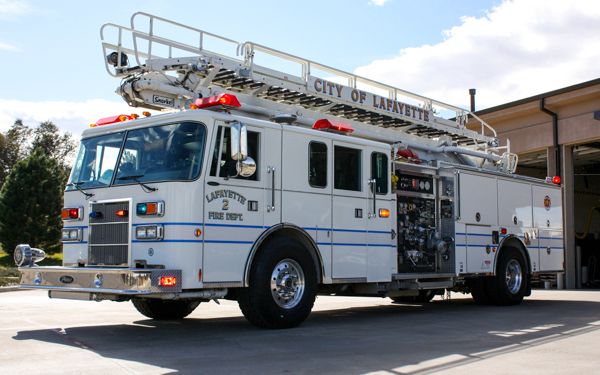 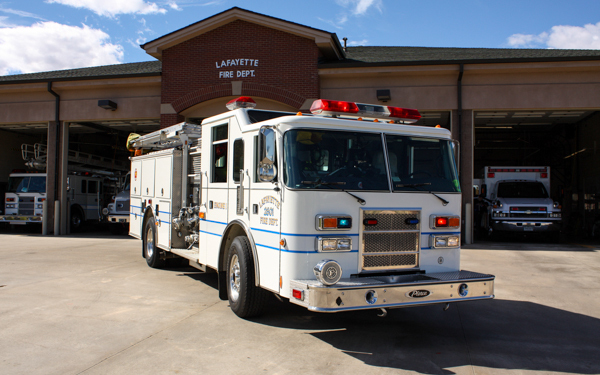 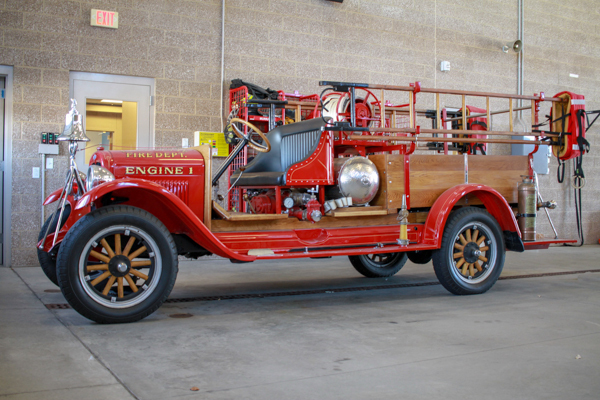 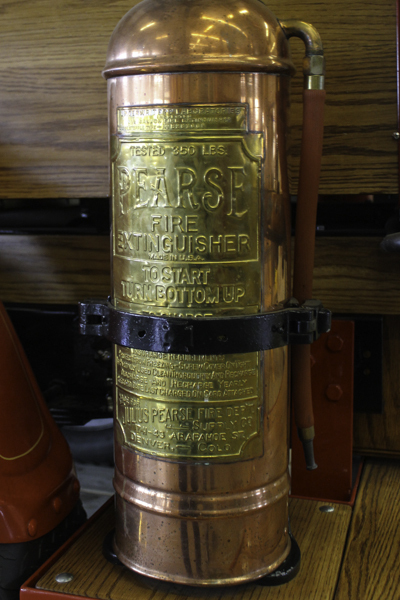 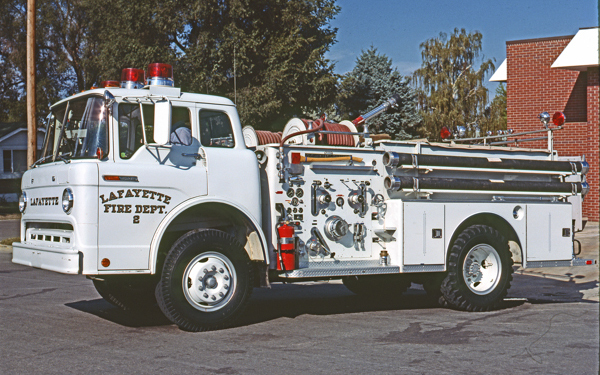 American LaFrance 50′ Tele-Squrt, also ran as Squrt 2605. 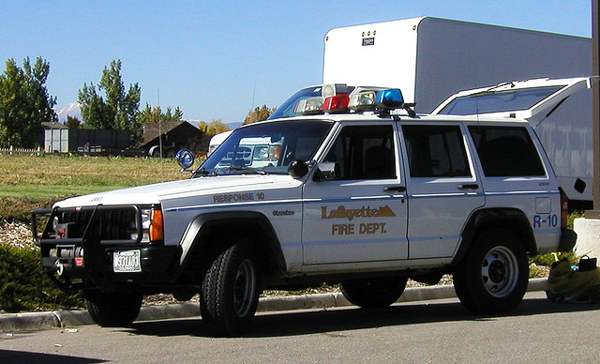 Jeep Cherokee (EMS QRV) also ran as Rescue 2627. 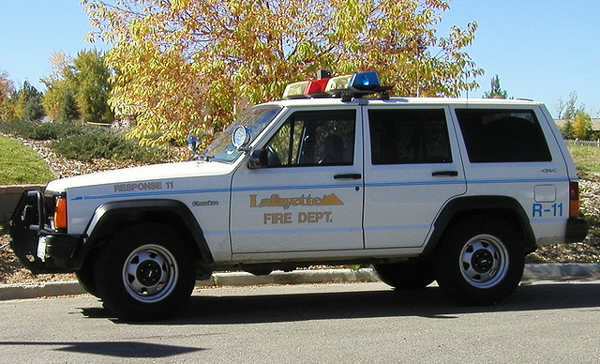 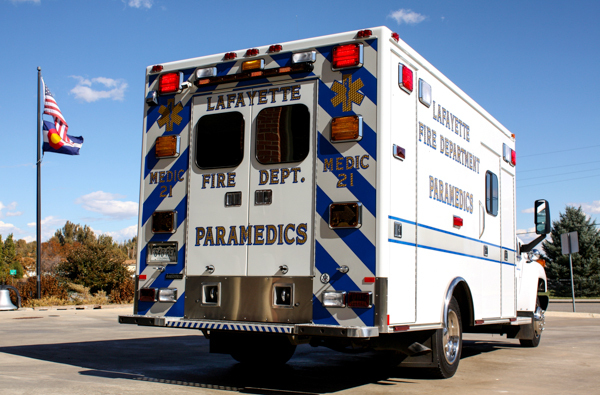 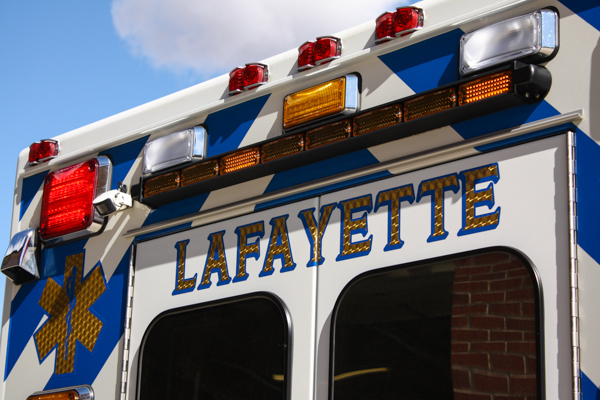 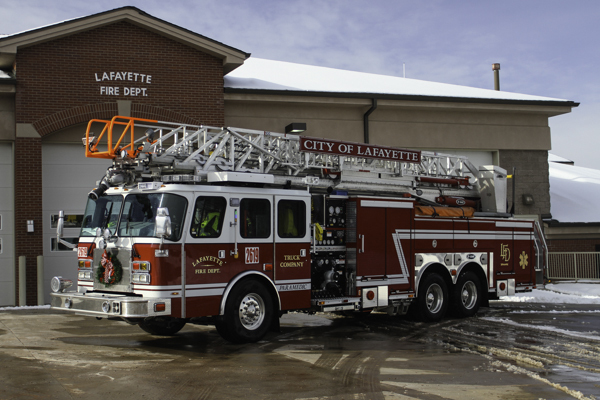 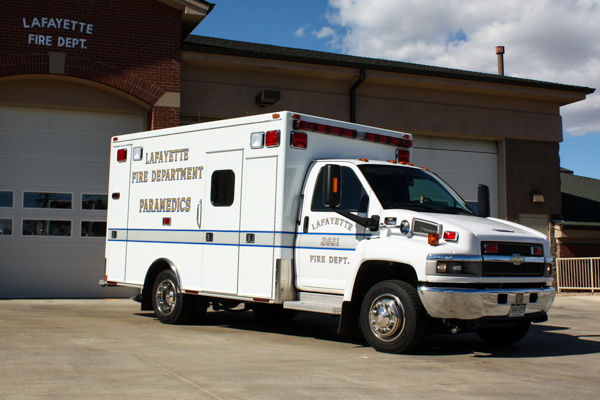 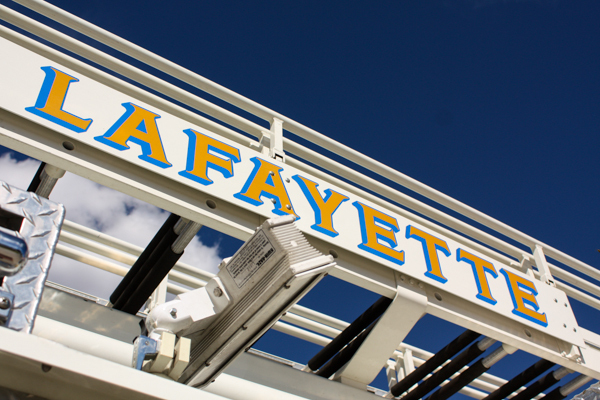 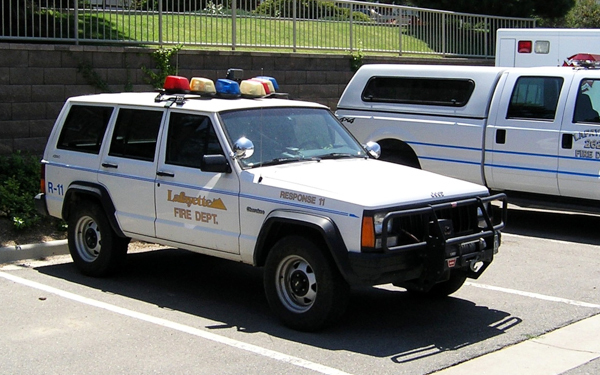 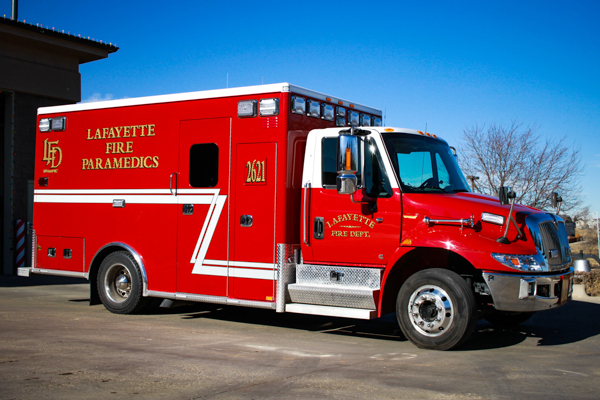 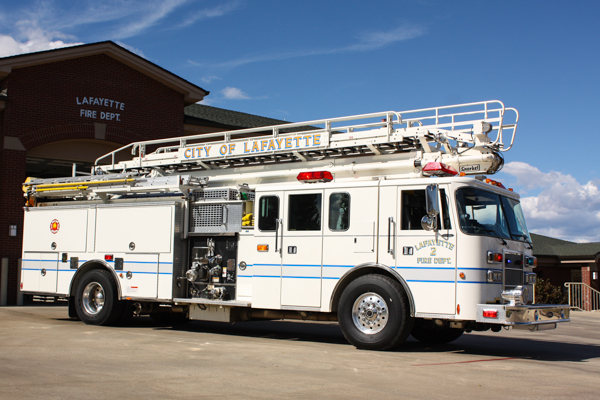 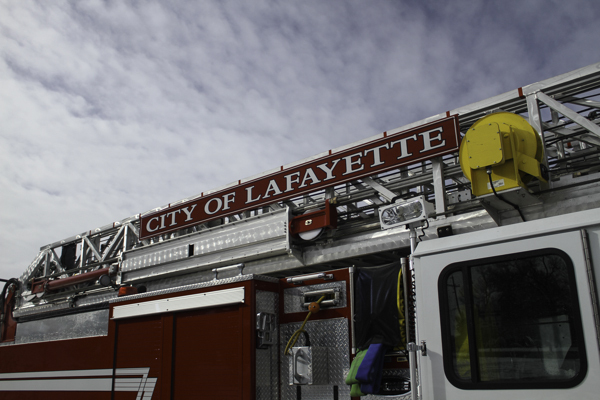 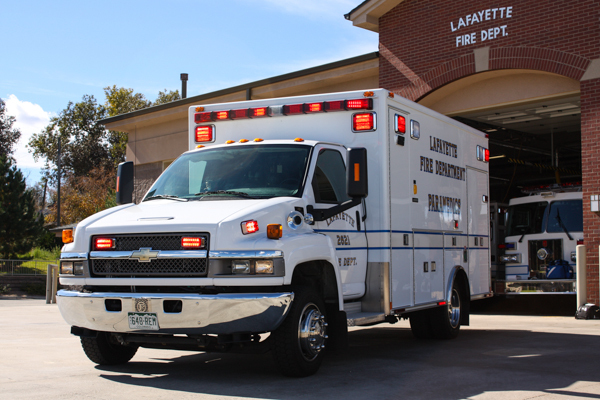 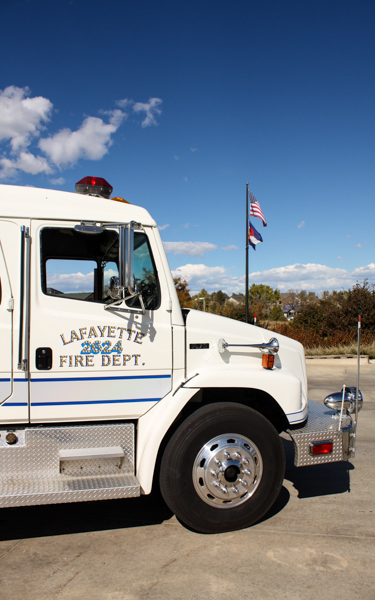 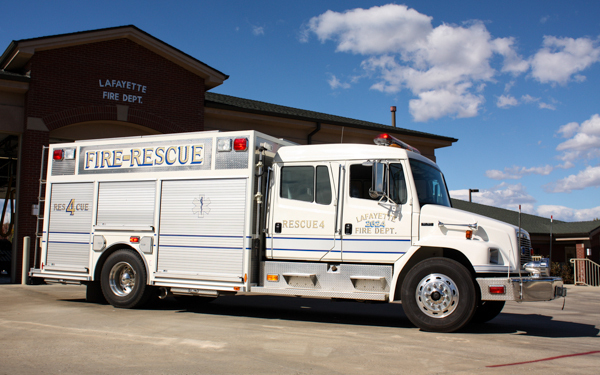 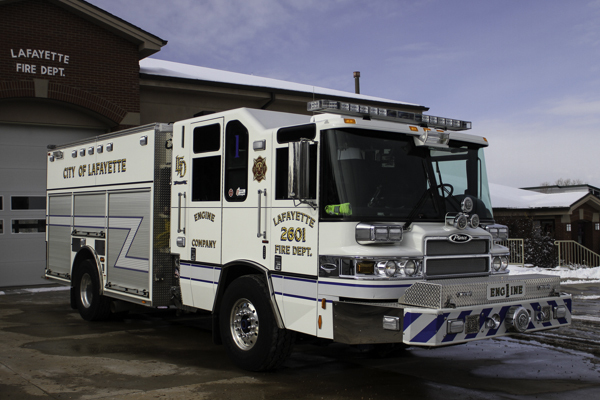 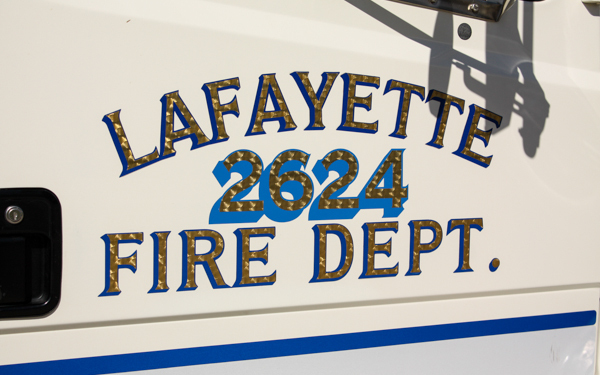 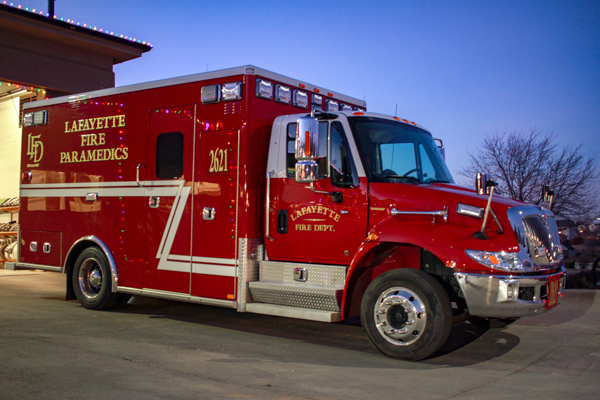 Lafayette Response 11 – Jeep Cherokee (EMS QRV) also ran as Rescue 2628. 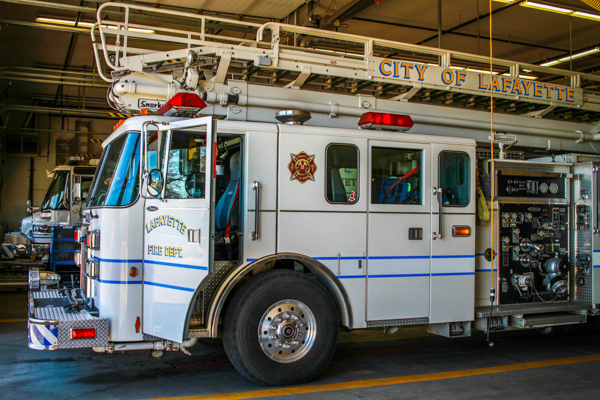 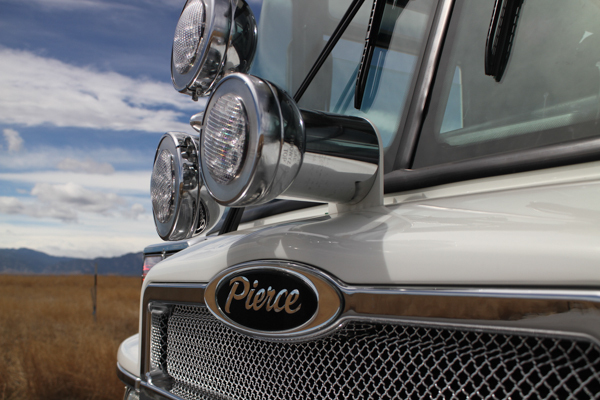 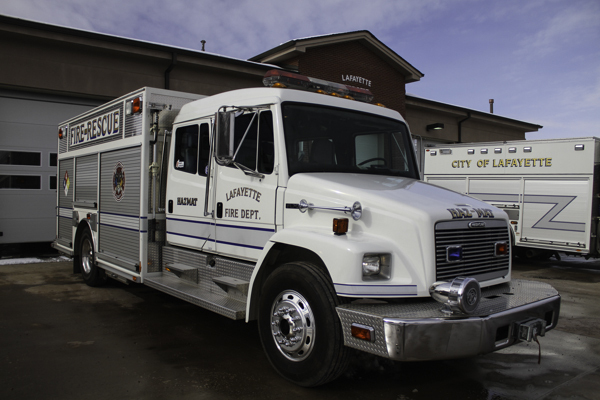 1998 Pierce Lance 65′ Tele-Squrt Snorkel 500 gallon water tank with 25 gallons of foam, currently Engine 2603. 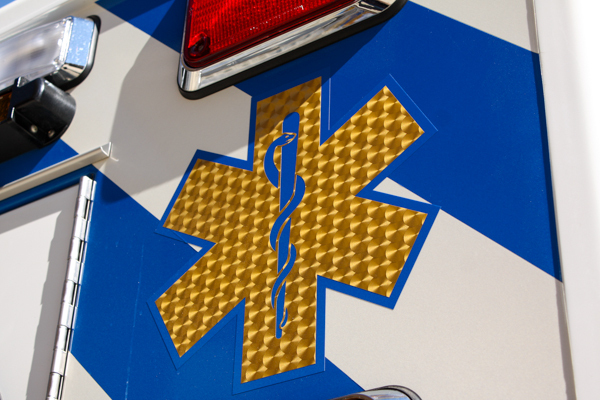 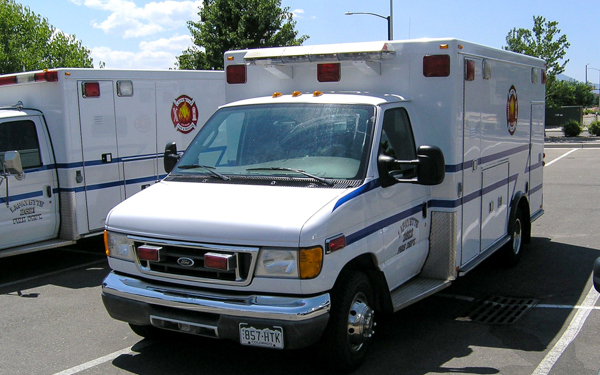 2003 Ford E-450 / Road Rescue, also ran as Hygiene Fire Protection District Ambulance 2822. 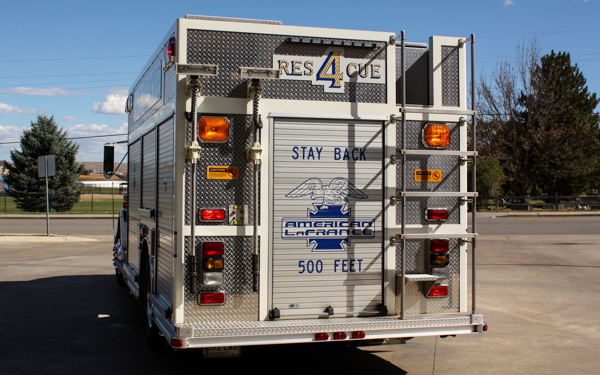 Ford F-450 / Road Rescue. 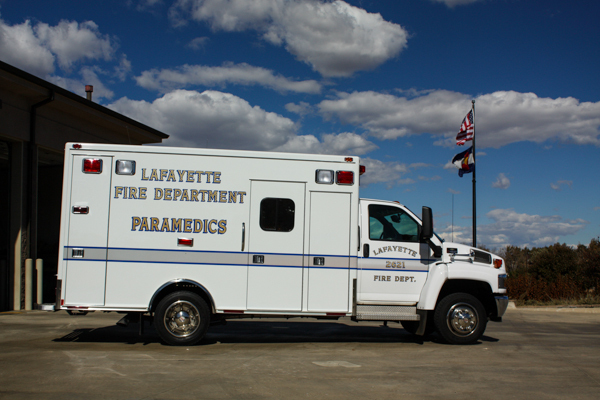 Ford E-350, donated to the Lafayette Police Department and was used as a Mobile Command Unit. 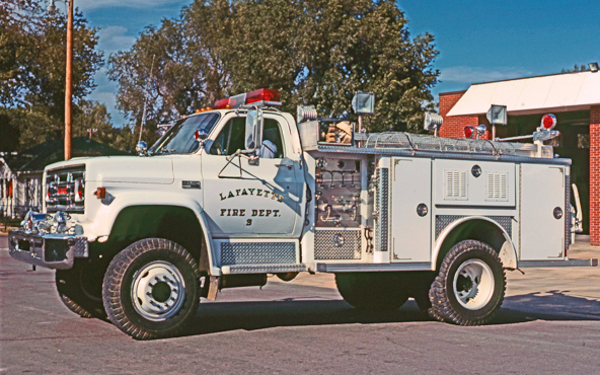 1991 Pierce Lance 1000 gallon water tank with 20 gallons of foam, also ran as Engine 2608, and is currently running as Hudson Fire Protection District Engine 2805. 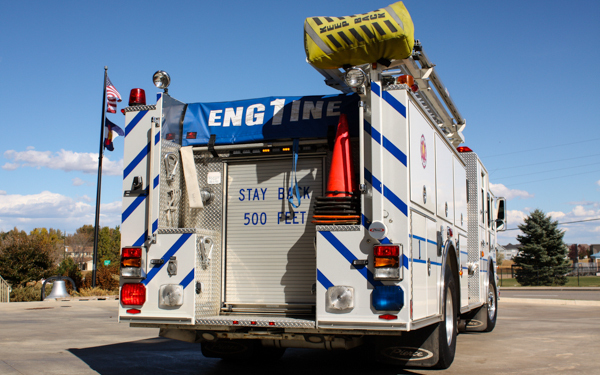 (Engine 1) 2001 Pierce Dash 750 gallon water tank / 1250 gpm pump (Waterous) with foam (FoamPro), also ran as Engine 2601 & 2602, and was sold to the Strasburg Fire Protection District. 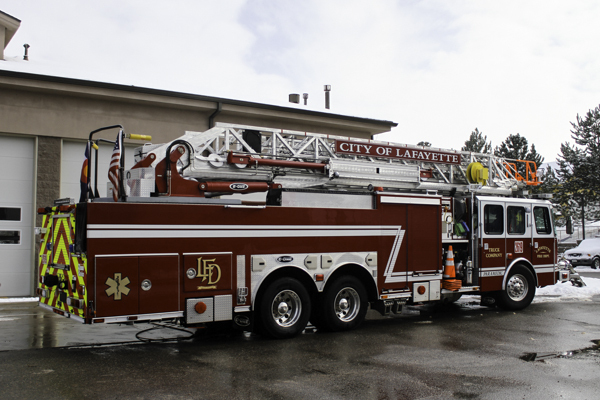 (Engine 1) 2001 Pierce Dash 750 gallon water tank / 1250 gpm pump (Waterous) with foam (FoamPro), also ran as Engine 1 & 2602. 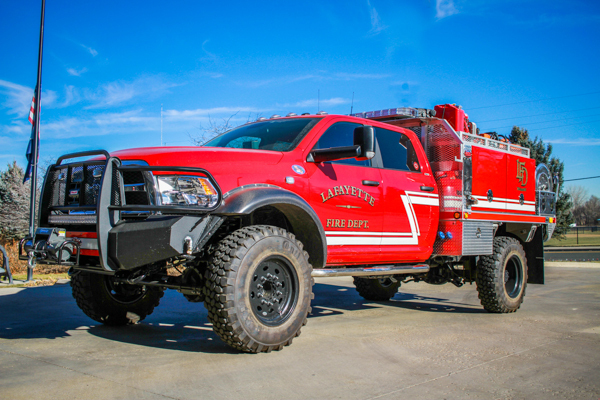 Ford 4×4 Type 6 280 gallon water tank with 20 gallons of foam. 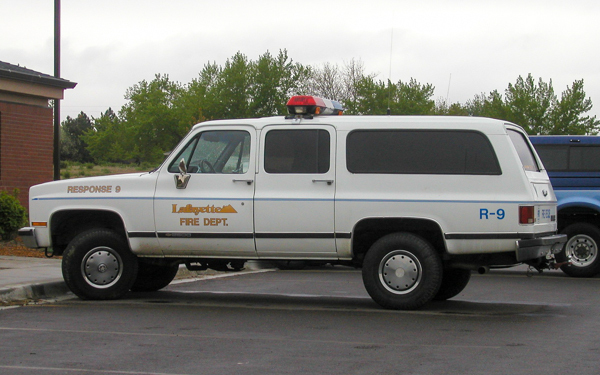 (Rescue 4) 2001 Freightliner FL-80 / American LaFrance, also ran as Rescue 4, and is currently running as Haz-Mat 2655. 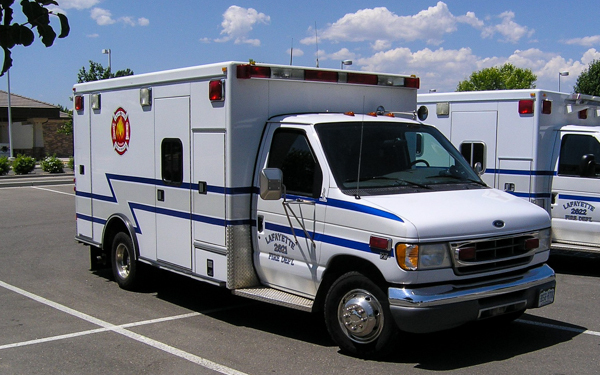 2008 Chevy C4500 / MedTec.